2 Corinthians 5:15-19 - And [that] he died for all, that they which live should not henceforth live unto themselves, but unto him which died for them, and rose again. 1 John 5:11 - And this is the record, that God hath given to us eternal life, and this life is in his Son. James 1:3 - Knowing [this], that the trying of your faith worketh patience. 1 John 4:9 - In this was manifested the love of God toward us, because that God sent his only begotten Son into the world, that we might live through him. Acts 13:39 - And by him all that believe are justified from all things, from which ye could not be justified by the law of Moses. Matthew 22:14 - For many are called, but few [are] chosen. Revelation 21:6 - And he said unto me, It is done. I am Alpha and Omega, the beginning and the end. I will give unto him that is athirst of the fountain of the water of life freely. 1 Peter 1:5 - Who are kept by the power of God through faith unto salvation ready to be revealed in the last time. Hebrews 2:10 - For it became him, for whom [are] all things, and by whom [are] all things, in bringing many sons unto glory, to make the captain of their salvation perfect through sufferings. Galatians 3:1-28 - O foolish Galatians, who hath bewitched you, that ye should not obey the truth, before whose eyes Jesus Christ hath been evidently set forth, crucified among you? Acts 13:47 - For so hath the Lord commanded us, [saying], I have set thee to be a light of the Gentiles, that thou shouldest be for salvation unto the ends of the earth. John 15:5 - I am the vine, ye [are] the branches: He that abideth in me, and I in him, the same bringeth forth much fruit: for without me ye can do nothing. John 15:4 - Abide in me, and I in you. As the branch cannot bear fruit of itself, except it abide in the vine; no more can ye, except ye abide in me. Psalms 7:7 - So shall the congregation of the people compass thee about: for their sakes therefore return thou on high. Revelation 7:10 - And cried with a loud voice, saying, Salvation to our God which sitteth upon the throne, and unto the Lamb. James 2:18 - Yea, a man may say, Thou hast faith, and I have works: shew me thy faith without thy works, and I will shew thee my faith by my works. 1 Timothy 1:16 - Howbeit for this cause I obtained mercy, that in me first Jesus Christ might shew forth all longsuffering, for a pattern to them which should hereafter believe on him to life everlasting. Ephesians 2:3-5 - Among whom also we all had our conversation in times past in the lusts of our flesh, fulfilling the desires of the flesh and of the mind; and were by nature the children of wrath, even as others. Acts 2:38-39 - Then Peter said unto them, Repent, and be baptized every one of you in the name of Jesus Christ for the remission of sins, and ye shall receive the gift of the Holy Ghost. John 17:4 - I have glorified thee on the earth: I have finished the work which thou gavest me to do. John 3:3-12 - Jesus answered and said unto him, Verily, verily, I say unto thee, Except a man be born again, he cannot see the kingdom of God. Psalms 73:3 - For I was envious at the foolish, [when] I saw the prosperity of the wicked. 2 Thessalonians 2:14 - Whereunto he called you by our gospel, to the obtaining of the glory of our Lord Jesus Christ. Acts 28:28 - Be it known therefore unto you, that the salvation of God is sent unto the Gentiles, and [that] they will hear it. Acts 17:3 - Opening and alleging, that Christ must needs have suffered, and risen again from the dead; and that this Jesus, whom I preach unto you, is Christ. Acts 13:26 - Men [and] brethren, children of the stock of Abraham, and whosoever among you feareth God, to you is the word of this salvation sent. Acts 2:39 - For the promise is unto you, and to your children, and to all that are afar off, [even] as many as the Lord our God shall call. John 20:19-24 - Then the same day at evening, being the first [day] of the week, when the doors were shut where the disciples were assembled for fear of the Jews, came Jesus and stood in the midst, and saith unto them, Peace [be] unto you. John 15:1-27 - I am the true vine, and my Father is the husbandman. John 12:36 - While ye have light, believe in the light, that ye may be the children of light. These things spake Jesus, and departed, and did hide himself from them. John 11:52 - And not for that nation only, but that also he should gather together in one the children of God that were scattered abroad. John 8:24 - I said therefore unto you, that ye shall die in your sins: for if ye believe not that I am [he], ye shall die in your sins. John 6:65 - And he said, Therefore said I unto you, that no man can come unto me, except it were given unto him of my Father. John 6:47-50 - Verily, verily, I say unto you, He that believeth on me hath everlasting life. John 6:45 - It is written in the prophets, And they shall be all taught of God. Every man therefore that hath heard, and hath learned of the Father, cometh unto me. 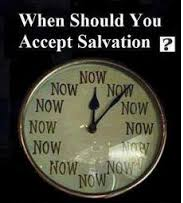 John 4:22 - Ye worship ye know not what: we know what we worship: for salvation is of the Jews. Luke 24:47 - And that repentance and remission of sins should be preached in his name among all nations, beginning at Jerusalem.